Watch this detailed presentation of why sunlight is good for you or take the continuing medical education (CME) course presentation. Until the 1950’s the sun was the most prescribed and most effective treatment for a variety of ills. 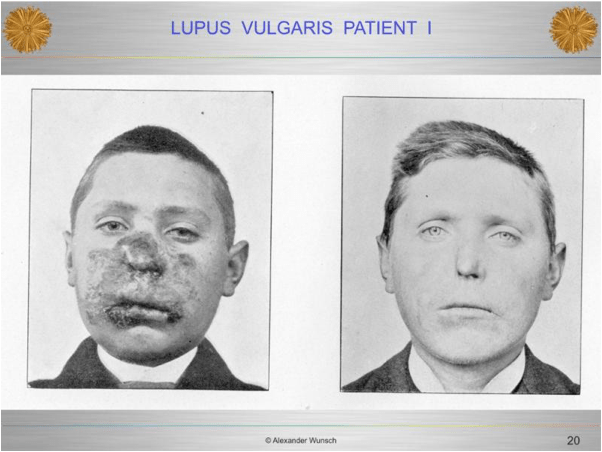 In this talk, Wunsch presents the history of heliotherapy, including some illustrative photographs of some of Dr. Auguste Rollier’s heliotherapy patients, such as this before and after picture of a man with lupus vulgaris who underwent light therapy in the early 1900s. 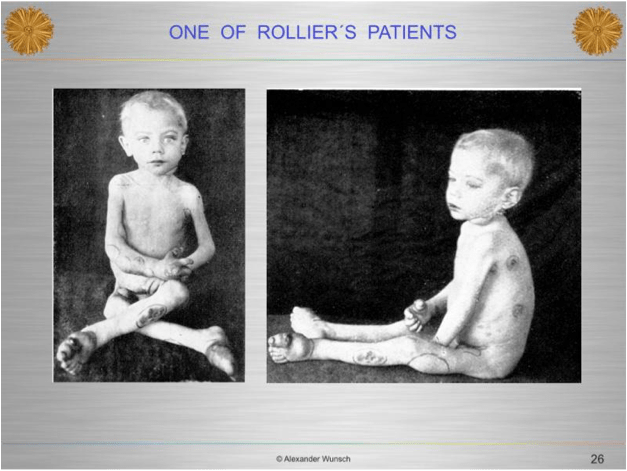 Dr. Wunsch presents another Rollier case study showing a young boy who had severe rickets and was weeks away from death. 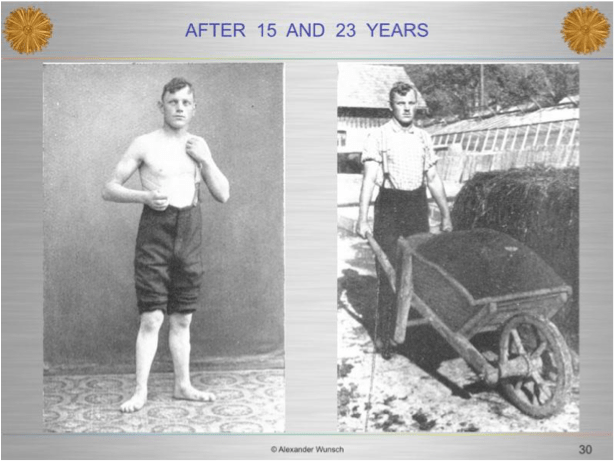 After undergoing light treatment, he lived a healthy life. 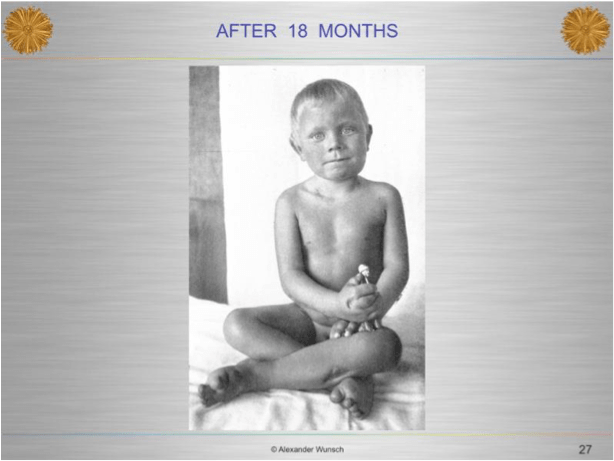 Below are pictures of before and after therapy, as well as at different stages of his life. There are many case studies documenting the positive effects of the sun and light treatment. For those who read French, you can order Rollier’s book and find out more about his practice. He also presented the picture below. What do you think it is? It is an entrance into the baths that coal miners used at the end of their workday. 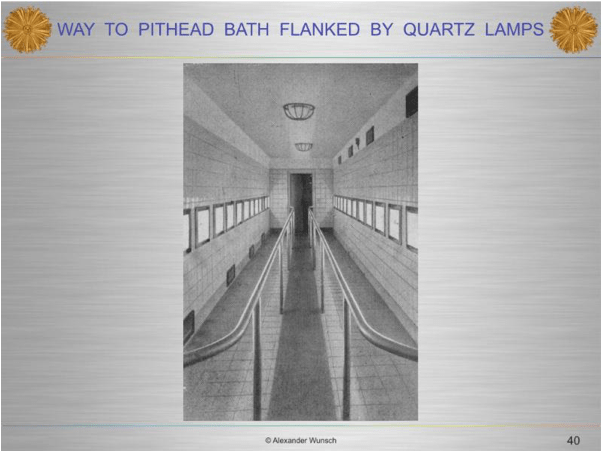 Understanding that the miners were underground all day, the owners of the mine, wanting to keep their workers healthy and producing coal, made sure their workers still received the benefits of sun exposure (in this case sun lamps). The workers stripped down and walked in a slowly moving, single file line, into the entrance of the baths at the end of their day. Was this a precursor to today’s preventative health plans? Could you see a company doing this today? Similar to lactation rooms, companies could provide areas for employees to take a “sun break” during lunch time. Would you like that in your workplace? 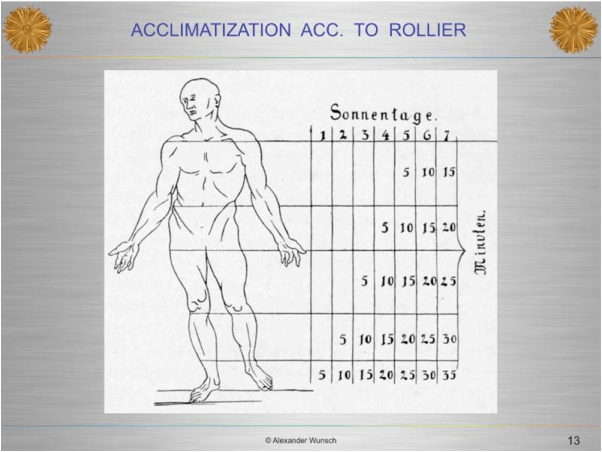 Wunsch presents this chart as an illustration of how light therapists gradually acclimate the body to light (sun or lamp). Session 1 you only expose the feet to 5 minutes of light. Session 2, after 5 minutes of exposure only on the feet, a blanket is raised to expose the lower leg along with the feet for an additional 5 minutes, etc. You can see that this is a very gradual process. Understand that coming out of winter, you will need to acclimate your body slowly before going in the sun. The chart above is very important, and our culture has lost sight of this point of view. If you hibernated all winter, don’t go whole hog at your first chance. Your skin is not prepared for it. During Wunsch’s presentation, he explains why – showing how skin cells acclimate to the sun and provide a natural sunscreen with gradual exposure. Secondly, let’s go back to thinking that the sun has healing properties. What can it do for us? There are a lot of benefits derived from sun exposure, and if done correctly, can improve your health.